Friday was another day on the road. We knew we had a fairly short drive. After all, it was only about 160 miles from where we were to where we were going. We pulled out of our wonderful site at the Columbus Thousand Trails park just before 8:30. The deer were waiting at the exit to bid us farewell. It was a beautiful drive. Wildflowers were in bloom and they were at their peak. Other than the short time we went through the southern edge of Austin and construction areas, the median and shoulders were loaded in beautiful blooms of blue, pink, while, yellow, purple and even orange. We saw Texas bluebonnets, Indian blankets, Indian paintbrush, bluebells, yellow daisies and a bunch of others I had no clue what they were. As I said …. it was definitely a gorgeous drive. We were pretty pleased with our new site too when we first saw it. It was riverfront. Well, we were pleased until we discovered that even though this was a fairly new park, they neglected to make sure the front sites were level. There were only two other motorhomes at this park and they were in the back row. The trailers and 5th wheels were in the front two rows … the uneven rows. There was no problem changing sites. The host knew the sites weren’t level. If that’s the case, why don’t they fix them? We put our big long yellow level down on a site in row number three. Bingo … the little bubble ended up in the middle. That’s what we were hoping to see. Once set up we walked down to check out the river. Yep … it certainly looked like we just might get a chance to put those kayaks in the water. Well, that’s what we thought until we discovered a storm was heading our way. 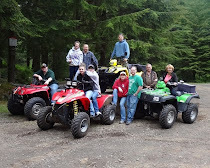 We already had plans for Saturday and sometime Sunday the weather wouldn’t be cooperating. Next, we headed into the little town of Llano. A lot of the little towns in Texas have their town center around the courthouses. Often you find great little cafes and unique shops. We stopped at the Acme Café in Llano for lunch. We were surprised to find a menu that could have been out of coastal Louisiana. Oh well … it was off to barbecue instead. We had a few things to do around the Llano and Burnet area. However, we were really watching the winds and possibility of hail and lots of other stuff the weathermen have been saying could be coming our way. Why have we had so much wind this season? Our plan is to get back into Arizona before the end of this week and California shortly after that but the prediction for those winds may change that plan. The little town of Burnet is just 30 miles east of Llano and this was the weekend of their annual Bluebonnet Festival. What fun we thought so off we went along with 30,000 other folks. At least the info we read about the festival indicated that many people would be attending. Well …. it wasn't quite what we expected and within about a half an hour we had visited all the vendors and were walking away without a single purchase. I had one more thing to do in Burnet and that was stop by the old Fort Croghan. The old fort is also a museum and the Stagecoach House had been moved inside it.. My great, great grandfather lived in this house when it was on Hamilton Creek. I’m not sure when he lived there but am guessing it might have been before he moved closer to the Colorado River and before he got involved in making and selling gun powder .. perhaps, 1850’s. I wasn’t really through with museums or sightseeing yet so next stop was the historical museum back in Llano. . The same parking lot for the museum was shared with the city’s visitor center and old railroad yard. I had to stop there too. On my way back to the RV park guess what I drove by. I love looking at local patterns and fabric but I’m not telling you what I bought or how much I spent. I'm not telling Terry either! Sorry about so many pictures but it was either that or post two blogs. I didn’t want to do that either. How interesting about your great, great grandfather. How cool to see what his surroundings looked like. I love looking at photos. You can put as many as you want in any of your posts! Loved the wild flowers along the roads in Texas. Hope the wind let up for you so you can get on the road again. Lots of beautiful flowers along your way. Loved hearing about your great great grandfather. I'd like to spend some time in Missouri where my Dad's family came from. Maybe on our way back from VA this fall. We don't have any wind today so hopefully tomorrow the calm will be headed your way. What an interesting post. 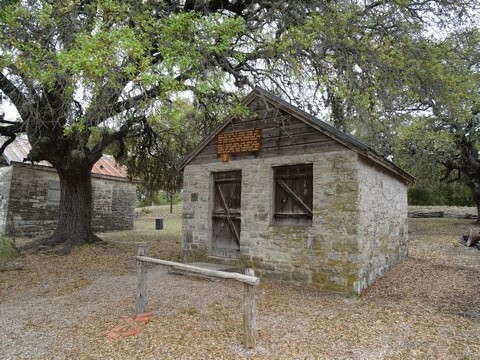 Great pics of Llano and especially of the Stagecoach house where your great, great grandfather once lived. It still looks absolutely solid! Looks like you had another good day with several things checked off your list. I love visiting historic places. Having family memories attached to them is a real bonus. You guys sure have had lousy luck with the weather in Texas !